Fluid-structure interactions of large amplitude vibrations are investigated for flows around an elastically mounted rigid circular cylinder, a long flexible circular cylinder, and the Tacoma Narrows Bridge. 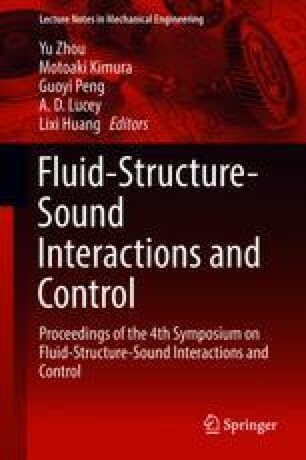 The governing equations of fluid flow and structure motion are solved implicitly for a stable solution. Weak coupling is introduced with predictors to simulate fluid-structure interactions without any iteration per time step. For an elastically mounted rigid circular cylinder and a long flexible circular cylinder, large amplitude vibrations are caused by starting vortices generated in the shear layers. On the other hand, for the Tacoma Narrows Bridge, large-amplitude torsional vibrations are maintained in two segments of the deck due to the matching of the dominant frequency of the rotational angles of the deck with that of vortex shedding. This research is supported by National Research Foundation (No. NRF-2016R1E1A1A02921549), Korea.